The next generation of LION Shredding equipment covers a wide spectrum of required shredding applications for the paper industry as well as for waste incineration and recycling operations. In the paper industry the shredding equipment is suitable for simple shredding tasks for lightweight pulper rejects, rugged pre-shredding applications for contaminated rejects, targeted fine shredding of pre-determined material sizes as well as eliminating ragger tails from pulper trash. Mobile shredding units are available for versatile applications – ideal for use on different locations. 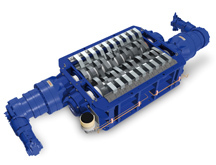 The LION XXL Series features individual hydraulic drives, completely modular construction, same cutting devices and blade sets in all machines. This ensures the highest shredding performance at a low maintenance level. Special tempered blades, which can be re-sharpened i.e. face grinded several times, make this series highly economical. 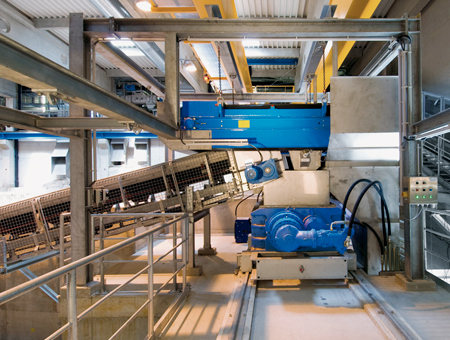 The unique protection zone – the large space between the block walls and bearings – offers maximum protection against abrasive substances and water.